Thinking "outside the box" is uncomfortable and difficult for many adults. For Bern Case, AAE, it seems to be second nature. Case, the soon-to-retire director at Rogue Valley International-Medford Airport (MFR), has a knack for generating unconventional ideas that help promote the airport and generate non-aeronautical revenue along the way. 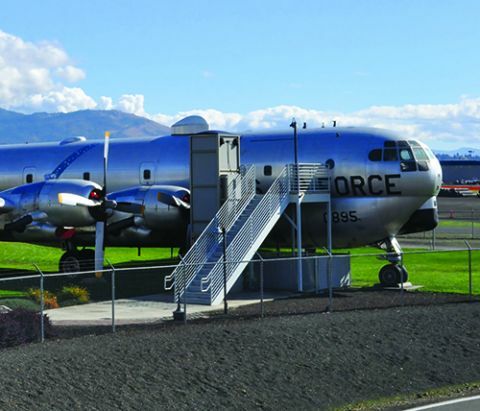 For example, there's a retired KC-97 Stratotanker parked permanently outside the airport fence that serves as a rental facility for parties and other special occasions. In the past year alone, it has been the site of more than 200 events. Then there's the replica of the White House Oval Office, created in a spare room inside the terminal. It's also popular for weddings and other celebrations. Concessions at the Southern Oregon airport further demonstrate Case's open-mindedness regarding facility development. Nine years ago, MFR completed a new terminal with a second-floor observation deck and reconfigured its restaurant to serve screened passengers and unscreened visitors from the same kitchen. With 410,000 annual enplanements, MFR is simply not big enough for two separate restaurants, Case explains. Instead, the airport installed a one-way mechanism known as a sally port that allows restaurant staff to pass food from the secure-side kitchen to customers on the other side of the TSA checkpoint, with a common wall separating the two populations. The clever arrangement provides MFR with two restaurants for the overhead of one, quips Case. Sales in the restaurant increased as well. "In 2008, we were making $56,000 a year with a conventional restaurant; last year, we made over $128,000," he reports, noting that 2017 revenue should be even better. "The approach works really well for us because it increased service and dollars," comments Case. Similar caged ports have since been added to restaurants at about a dozen airports, he reports. MFR also added a sally port in its gift shop. "We have an area that serves both secure and non-secure people operated by one person," describes Case. As with the restaurant, annual sales jumped accordingly-from $24,000 to $91,000. Case even manages to generate a little revenue (about $600 per year) from the airport's animal relief area. "We partnered with a local organization, Dogs for the Deaf, that was looking for some greater exposure," he explains. "They sponsor the area, and MFR gets some compensation for providing the space." One of the organization's leaders perhaps said it best: "Bern even gets paid for poop." Apparently, Case had people "feelin' the Bern" just like Bernie Sanders did during his recent presidential campaign. Sponsorships are leveraged in numerous other areas as well. The installation of hand sanitizer stations throughout the terminal, sponsored by Valley Immediate Care, brings in $2,700 annually. Baggage carts are provided to passengers for free, but they are sponsored by a local business and that pays the airport $3,000 a year for the associated advertising exposure. Another $6,000 per year is yielded by two large-screen televisions that alternately broadcast Fox, CNN and a promotional video from Adroit Construction, the company that built MFR's terminal almost a decade ago. The Oval Office replica was also developed using sponsorship dollars, and the KC-97 was donated to the airport. Working closely with the airport's public relations staff, Case considers both programs community outreach mechanisms as well as sources of revenue. "We have had weddings, an Eagle Scout Court of Honor, a centenarian's birthday party, and other events in the Oval Office space," he comments. "While we don't charge much-last year it made just over $3,000-the concept adds much to the airport by turning it into a destination spot." Although the donated KC-97 required an elevator and other investments to make it comply with local codes, it nets more than $6,000 a year. "Again, it is a wonderful, novel addition to our airport's image," emphasizes Case. "We pipe in audio from the tower; visitors can sit up front and touch the controls, and more." According to Case, MFR was one of the first U.S. airports to handle advertising in house rather than use an agency. "When I arrived in 1994, the airport got 50 percent of the ad revenue-about $25,000 a year," he recalls. "Throughout the years, we added more signs, outside billboards and kiosks and went in-house. We now average over $300,000 a year on revenue, and there's a waiting list of mostly local firms ready to advertise with us. Our maintenance guys change out the ads, and our paralegal writes up the contracts; it's as simple as that." Like any good businessperson, Case realizes there are two sides to every balance sheet. As such, he focuses on costs as well as revenue. To help decrease energy expenses, he secured a grant for solar panels to place on top of canopies in the parking lot. "We covered the walkways and generate so much electricity that we're making more energy than what we actually use," raves Case. "Besides being a zero-carbon energy footprint in the 16-acre parking lot, we get about $12,000 a year by making the meters run in reverse some of the time...The utility is actually buying electricity from us." He also managed to cut costs associated with the airport's fog-seeding program that dates back to the 1950s. Previously, a small aircraft flew back and forth above the airport dispersing dry ice to help dissipate thick fog that would otherwise impede flight operations. Case and his crew developed a modernized system they call Casper that uses a large balloon (18 feet wide, 20 feet tall) to accomplish the same result. Tethered to an Operations truck, the balloon is raised 500 feet into the sky with a winch over the runway, where dry ice is dumped from the basket by remote control. Now, the Operations crew handles the task without a pilot or plane, and gone are service contracts that ranged from $50,000 for a mild year up to $250,000 during years with particularly foggy weather. Last year, the Casper program cost MFD just $6,800-and garnered appreciation from airlines serving the airport. Costs to run the all-contract, on-site fire station for the Index B airfield ran $581,000 in 2016-probably the lowest in the country, says Case. In a similar vein, MFR uses contracted armed security personnel to assist TSA officers instead of local law enforcement. The practice is allowed by the FAA and costs the airport $160,000 per year-about one-third of what most similar size airports pay, he notes. "I guess I have always had a penchant for saving money," Case shares. "I actually started out, way back when, as a mortician. I wrote a book on how to save money on funerals; but when it got published, I got fired. That said, he considers himself fortunate to have landed in a career in aviation. "It's hard for me to retire, but it's time," says the energetic 70-year-old. "I really enjoy what I do. We actually have fun running the airport. It's a blast." Before his 24 years with MFR, Case worked at Lubbock Preston Smith International and MBS International near Saginaw, MI. "I actually started in 1978 in Salt Lake City, where I was in the Operations staff for eight years and ended up as manager of Operations." Case even married an aviation-friendly gal. His wife, Michelle, invented the Turbo Way passenger boarding ramp in 1998 and produced about 100 units before selling the business to her fabricator in 2002. The product, now sold by KCI, remains a popular option that helps airports accommodate the general public and passengers with disabilities. As for retirement, Case is considering some industry consulting work, and he and his wife plan to visit their 15 grandchildren throughout the country-but not right away. "Medford is the longest place of any area where I lived, and it's a special place," he says. "You enjoy California weather and Oregon taxes, which is a great combination." 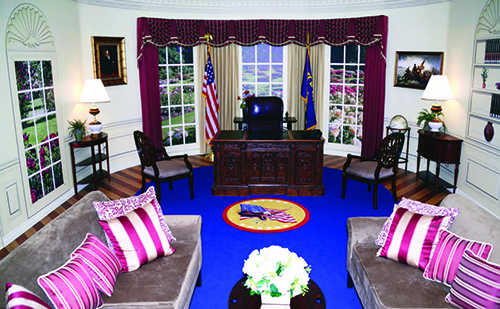 A replica of the Oval Office inside the terminal is a popular rental venue for weddings, birthday parties and other special events.